A heart-felt thanks to those selfless individuals that gave the ultimate sacrifice while serving in our armed forces. We honor you this past Memorial Day weekend, and the other 364 days of the year. You and I – Try it now. Take in a deep breath with your nose and mouth, fill your lungs with air, and slowly exhale through your mouth for 5 seconds. Do it at least two more times and you should feel better. This is a great skill to quickly use before a tough conversation, an interview, a presentation, speaking up when we are normally silent, when we feel anger coming on, when we’re lost, stuck in traffic, late for an appointment, even helping our kids de-escalate from a tantrum – basically when we are anxious or stressed about anything. Calming our breathing down puts us in the right mental state to think clearly, pray for guidance, complete our task, and look for solutions instead of dwelling on the problem. It is a quick fix to immediately feel better and reoriented. SEALs break things down into the smallest increments – They refer to it as “simplifying the battlefield.” It means eliminating distractions. Devine states: “When we eliminate distractions, we can better see the simple, elegant solutions and remain front-sight focused on the right way forward. 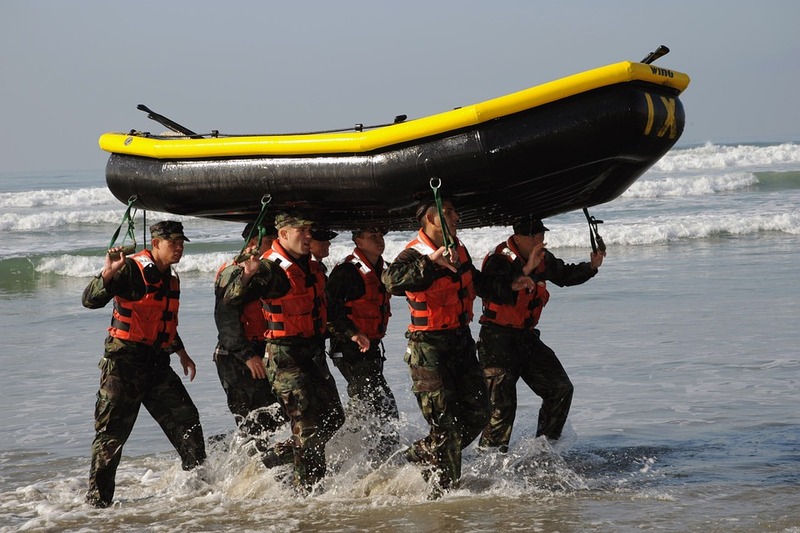 Even elite teams can get distracted and veer toward the complex.” (pg.46-47) He talks about a training exercise potential recruits must pass to progress in his Seal Leadership Program. They take the normal push up position, and then have to maintain that position for 45 minutes. The majority fail the test the first time after about 5 minutes. Those that eventually pass the test have discovered the secret: you have to break the 45 minutes down into seconds – completely having your mind and body in that present moment, second by second, then minute by minute.and believing that you are far more capable of doing beyond what you envision your limitations are. You and I – Wow, distractions – where do I start? Just like the SEALs do, in small parts. Maybe developing the discipline of turning off our electronic devices for a set amount of time every day? Possibly moving into a different room to work on a project that requires concentration, or a school assignment. Setting a timer and giving laser-like focus to the task at hand until the set time is up. Perhaps being okay with unopened email. Increasing our face time with family and friends – and decreasing our virtual time with them. What about the 45 minute push-up example? What is overwhelming to us now that we need to break into small, manageable parts? Extreme example – I recently had the unpleasant adventure of flying from Dallas to Orlando while passing a kidney stone. I would not recommend you trying this at home. The first response was panic because I didn’t know what was wrong. Was a major organ giving out? Had I been bitten by a Brown Recluse Spider? Anyway, I started with short, deep breaths to try to calm my mind and body down. During those excruciating 3 hours – I also attempted to fill my mind with prayer, Bible passages, counting in my head from 1 – 100 while clearly visualizing each number, and positive mental images of puppies running joyfully through endless meadows. Though the pain remained, those practices helped provide a buffer until I could get medical attention. From behind us, we could hear the 4-foot waves crashing in from the Pacific. The trouble was, we could never seem to get connected with the cadence of when they were going to next wash over our faces, filling our eyes, ears, throats and noses with sand, stones and seawater. The not knowing is part of how this “evolution” (Navy SEAL-speak for a really challenging exercise) gets the cheery name of “surf torture.” You don’t know when you’re next going to feel like you’re drowning. The task at hand is to manage your fear. While all of this is happening, something is washing over your mind as well: fear. Fear that you may be drowning. After all, our minds have a very ancient job to do, bestowed upon them by instinct: watch out for threats to our existence. It is natural then that during surf torture, your mind may start to wander and do its thing; running through various disaster scenarios, convinced that death could be rolling in with the next wave. Want to know the secret behind how to get through this evolution? Stop thinking about yourself and keep your eyes on the team. You see, if you get trapped in your own experience surf torture is absolutely just that: torture. It’s designed to be a psychological test even more than a physical one: You constantly feel like you could be drowning. With every wave, you feel like you’re going to get dragged out to sea. With every minute that ticks by, you get colder and have more trouble getting your breath and keeping your faculties. Your fight or flight instincts are pinging all over the inside of your brain, looking for an escape hatch. Very interesting and thinking the Navy Seals are truly special people. Wonder if there are any women in the group? Thanks for the excellent article—-as usual. Yes – they are very special. Did a Google search regarding women in the SEAL program – the most recent article said they should be joining units in 2017, and obtaining officer positions in 2018.